Located in Vilanculos, Hotel Dona Ana is by the sea, a 1-minute drive from Vilanculos Beach and 8 minutes from Municipal Market. This 4-star hotel is 6.9 mi (11.1 km) from Vilanculos Coastal Wildlife Sanctuary. Make yourself at home in one of the 48 air-conditioned rooms featuring LCD televisions. Complimentary wired Internet access keeps you connected, and satellite programming is available for your entertainment. Bathrooms have showers and hair dryers. Conveniences include phones, as well as laptop-compatible safes and desks. Take in the views from a terrace and a garden and make use of amenities such as complimentary wireless Internet access. Additional amenities at this hotel include babysitting/childcare (surcharge) and tour/ticket assistance. Enjoy a satisfying meal at Cohler serving guests of Hotel Dona Ana. 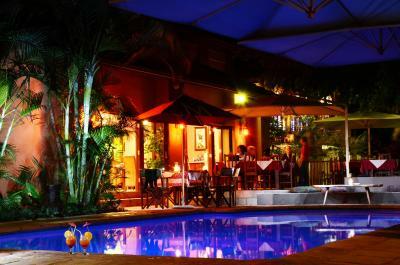 Relax with a refreshing drink from the bar/lounge or one of the 2 poolside bars. A complimentary English breakfast is served daily from 6:30 AM to 10 AM. Featured amenities include dry cleaning/laundry services, multilingual staff, and a safe deposit box at the front desk. A roundtrip airport shuttle is provided for a surcharge (available 24 hours), and free self parking is available onsite. When would you like to stay at Hotel Dona Ana ? Each day we'll check prices and send you an email for your selected dates at Hotel Dona Ana. If you don't have specific dates but would like to check prices for say next weekend or say next month we can check the price too. Click to write a review and share your experience of Hotel Dona Ana with other travellers.